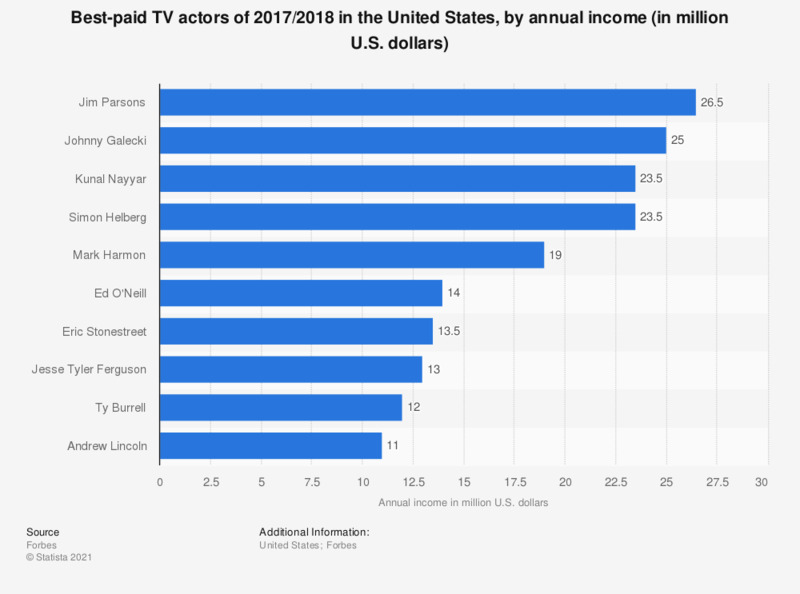 This statistic displays the top rankings of the best-paid TV actors in the season 2017/18 in the United States. Jim Parsons of the Big Bang Theory is the highest paid actor of the season, with an annual income of 26.5 million U.S. dollars. George Clooney was 2017's best paid movie actor, with an annual income of 239 million dollars. The source provides the following information about the methodology: "This list measures earnings before subtracting management fees and taxes; figures are based on data from Nielsen as well as interviews with agents, managers, lawyers and syndication experts. It only examines men– a separate list of highest-paid TV actresses will be published in the coming weeks, while the highest-paid film actors and actresses have already been ranked."